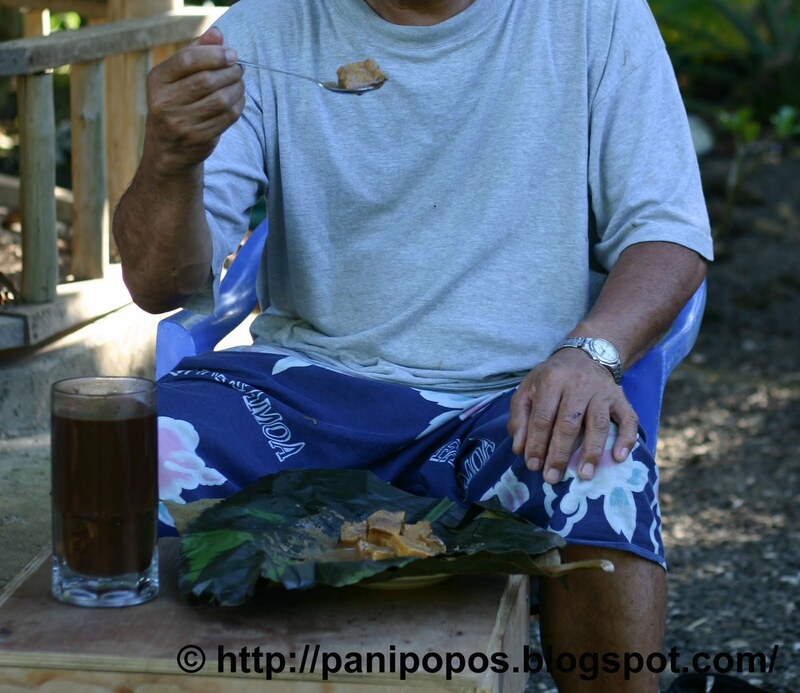 My Dad went through a stage where he was eating fa'ausi every morning for breakfast. No-one knew this because the man rises at an obscene hour of the morning and does work outside or goes for a walk - or at least that's what we thought he did. One day, I snapped him out sitting in front of the house, spoon in hand, huge mug of koko samoa (like seriously, who drinks that much koko?) next to an unwrapped, half-eaten package of fa'ausi. "Oh, since when did you start eating fa'ausi in the morning?" I asked him. "Oi, se...The other day this kid came around selling fa'ausi and I felt sorry for him so I bought a package. He's been coming around ever since." Dad replied. "Since when?" I asked again. "Oh, maybe a week now", he admitted, with a smug, self-satisfied grin on his face, much like a cat that's just swallowed the family goldfish. See the title picture up above? Behind 'Panipopos Kitchen'? The far left photo is what my father was eating that morning - pumpkin fa'ausi. One taste of this, and you might get ideas about eating in secret too. The fa'ausi sauce is so simple that you can make it while your fa'apapa are baking, and then leave it to cool. By the time you've cut up your fa'apapa, your fa'ausi sauce will be ready to pour over it. Make sure your fa'apapa has cooled to room temperature. 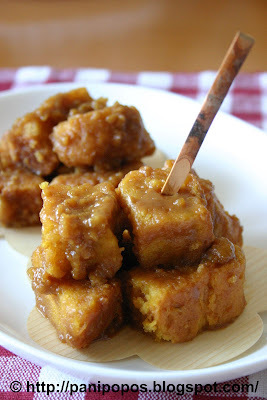 Then cut into cubes (½-1 inch squares) and set aside in a bowl. Put the sugar and water in a heavy-based saucepan and boil over medium high heat, stirring occasionally, until the sugar caramelises to a dark golden brown. Immediately add the coconut milk, being careful to stand back a little because the sauce will bubble up vigourously. Be careful not to burn your hand on the steam that rises up either. Once the mixture has settled, stir the sauce well until well-combined. Turn off the heat and leave the caramel to cool. 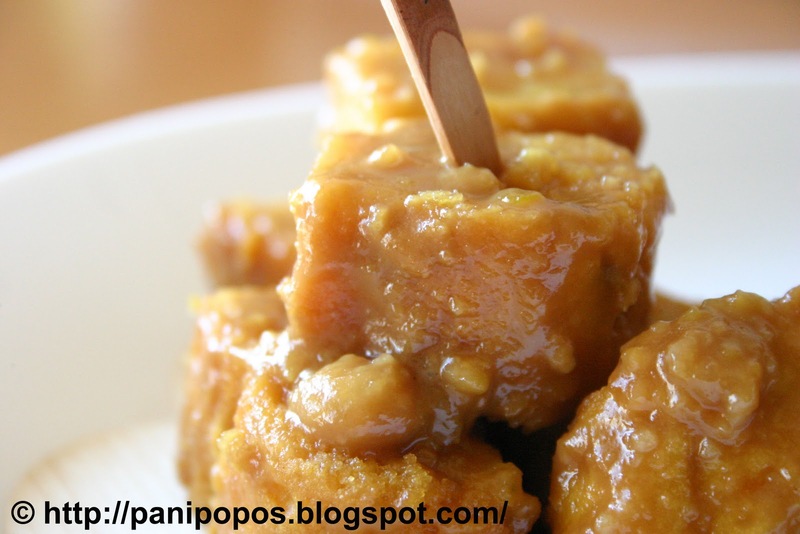 (See the puligi recipe for things that can go wrong while you're making coconut caramel). 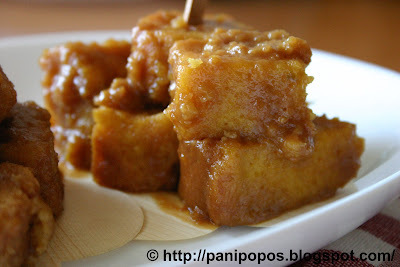 Pour the coconut caramel over the fa'apapa and mix well to cover all surfaces of the cubes. Leave for at least an hour (preferably longer) for the sauce to soak into the fa'apapa. Serve as a dessert or snack. Keep leftovers in the refrigerator and gently reheat to serve. Mahalos for sharing.. i'm going to be 500lb after eating all this great food recipes your sharing..thanks again..Aloha no..
Hey- It is Nancy T. I sent an email to you today to check up, but I happened upon your blog and love it. Very well done. I am on a cooking jag right now and cannot wait to try your recipes. Hey Nancy! Happy you like the blog...If you try anything from here, let me know how it goes. Aloha Hiloboy, thx for dropping by the blog! my husband has been craving for this but fa'ausi taro, do I just substitute the taro for the pumpkin? Also do you have the recipe for pisua? Love your recipes, for a palagi I am learning the samoan cooking. Hi, good on you for learning how to cook Samoan food...I'll try to make a pisua and taro fa'ausi recipe for you as soon as I can...Cheers! Hi, I can't be exactly sure, but with this wet method of making caramel, one thing can really screw it up - sugar crystals...So try this...dissolve your sugar completely in the water over the heat and then leave it to bubble away (without stirring) until you reach the desired colour...You can also just leave the water out altogether and use the dry method to melt the sugar (see my puligi recipe for how to do this)...If you are still having problems, there are a few more tricks I can give you...Good luck and thank you for your query! Talofa lava, I am currently making your fa'ausi, My fav. when I was a young one was the pumpkin version. These days any will do, just need to find someone to make it lol. Anyaway I can't seem to access the pumpkin version, any ideas why? Hi, thank you for trying my recipe...I have no idea why you can't access the pumpkin version....I just checked the link and everything seems to be in working order...Please email if you still can't get in and I'll just email you the recipe...Good luck! No I tried again this morning and I still can't access that particular page. If you are able to email it to me that would be great. I double-checked the link and it should be working. Have also emailed the recipe. All the best! 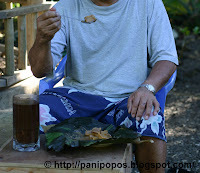 Please, please could youy post a taro fa'ausi recipe? Hi Bee, taro is hardly ever available here, but I'll keep an eye out.